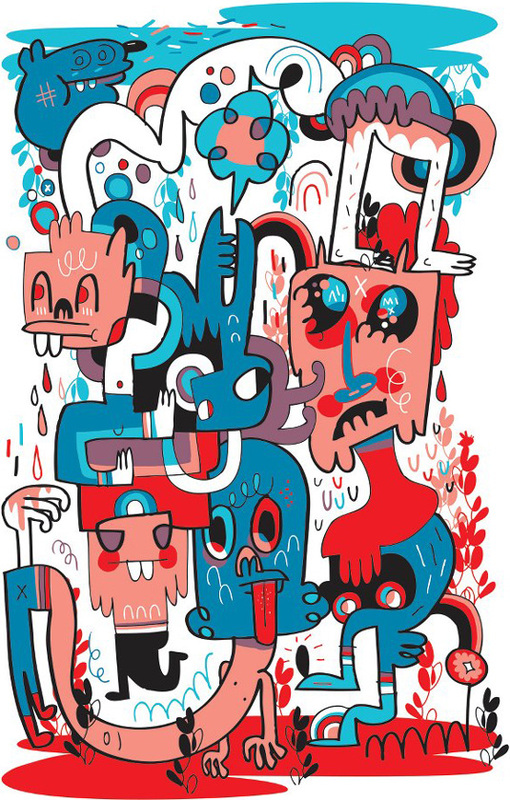 Jon Burgerman is a man with a dry sense of humour. His rainbow coloured cartoon styled musings reflect a less than rosy point of view. But Jon’s humorous style has effortlessly melded a career that spans both fine art and commercial design. Officially listed in Google as an ‘artist and salad enthusiast’ Jon recently sacrificed his colon to partake in a spot of Soda Pop Racing, Cheese Grating Racing and a Vegetable Toss Off for the ‘Hunger Games’ exhibition. The event – which looked like a load of fun – also had a serious point, looking at; “the contradiction of sports and their unhealthy commercial patrons are highlighted and even celebrated”. 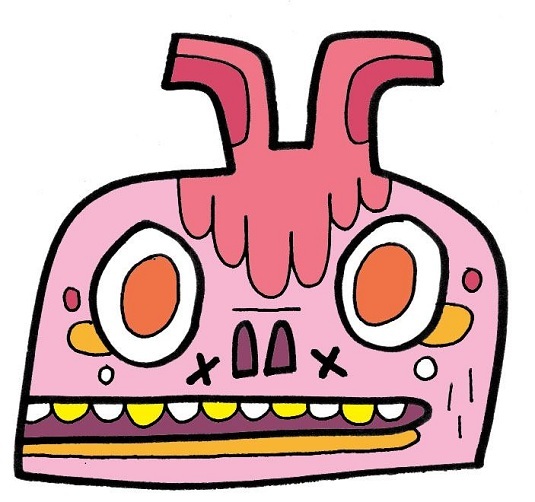 It would be difficult to find a more comprehensive artists FAQ’s page than on Jon Burgerman’s website, however we still had one or two. Q) How did you conceive your characters and current style? Did they evolve over time? The characters are an evolution of the characters I used to draw as a child. When I was young I was into making my own comics. I used to copy ideas from things like The Beano and Dandy, and characters from Garfield, amongst many others. Everything you see goes into the melting pot of your mind. Today, as before, I am still being influenced by the cool things I see, with each thing making a little impression on how I work. I hope that my work will continue to evolve and develop; I find it boring to keep working in the same way all the time. Q) You work in a variety of mediums – from shirts to teapots, your artwork can be purchased on a diverse selection of objects. Do you feel that you need to liberate your drawings from paper? Why do you think your style suits these various surfaces? Because it’s there (?). I’m not sure but everything starts off as a drawing. The white piece of paper sat in front of me is a portal. Where you go from there is up to you, you can go anywhere. An architect makes a sketch and eventually a building is unveiled in a city. Drawing is a powerful act, with the swipe of a pen you can create a whole world, or a teapot. 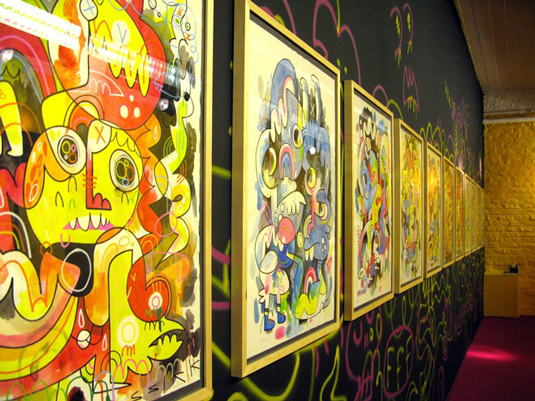 Q) You have been in some pretty awesome gallery exhibitions, art fairs and worked with Kidrobot. What is your favourite way of working and showing your new artwork? Do you like having so many platforms to exhibit and sell your work? My favourite way of working is just pen on paper. My favourite way of showing new work is to just pin it to the wall. The different platforms open up new possibilities to connect to people and share my work, and world, with them. It also opens up interesting problems, such as designing a vinyl toy made me think how my characters looked in three dimensions. Working in different ways, with different people in different counties only serves to test the sensibility of your work and open up challenging ways of keeping it fresh. Q) Do you think about your audience when making your work? Do you target anyone specifically? Can you describe your ‘typical’ Burgerman fan? I think it’s very dangerous to second guess what your audience might want. As an artist my work has always been self-directed. I think it’s a mistake if a little further down the line, once you have some attention for your work, you start to think of the audience as a client that must be appeased. I’d like my audience to be surprised and delighted once in a while with what I make. We all have to grow together. 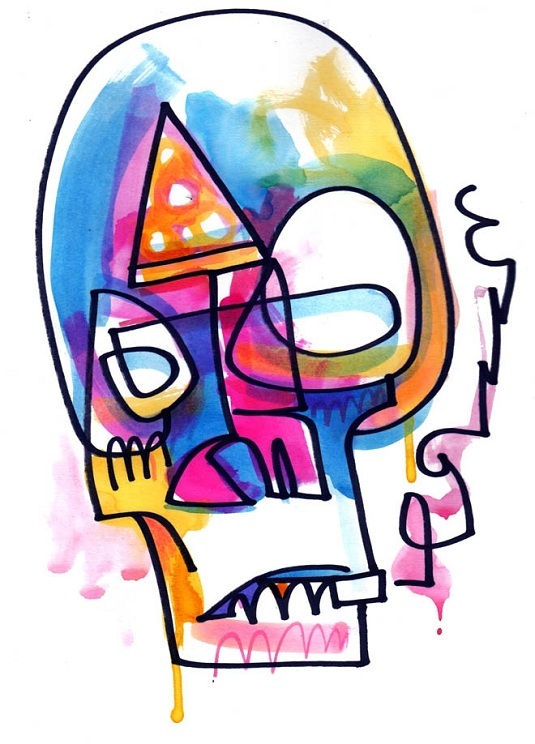 Someone wrote on Facebook recently that they ‘missed the old Jon Burgerman’. I’m not even sure what they meant, I still pretty much peddle the same poorly rendered scrawls as I used to do. I take it as a growing pain. The only person I’m trying to please in making the work is me. Q) Where do you prefer living, New York or Shoreditch? You know, there’s not a huge difference between where I am now in Williamsburg Brooklyn and Shoreditch. New York is great and so is London but for now I prefer being here in New York, if only for the fact this is where all my clothes and pens are, and I need them most days. 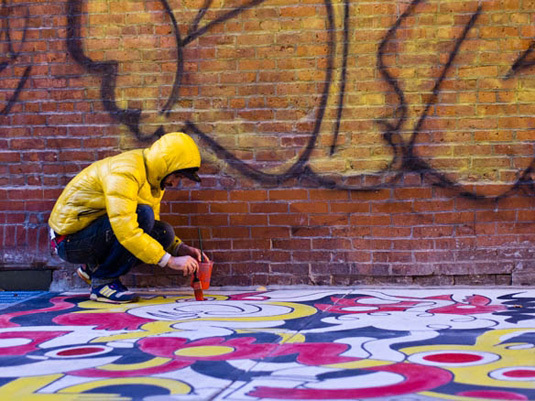 Q) Are you inspired by the street art/art scene in general here in East London? I have a bunch of friends in the ‘scene’ that I always look out for. It’s nice as I walk up Old Street to see what new stuff has been plastered around the place. I always seem to bump into the brilliant Connor Harrington near Brick Lane. I’m often massively jet lagged and frothing at the mouth so I’m not too sure what we talk about though. Q) Lastly, what’s coming up for you? Any cool projects? Amongst a whole bunch of things next year sees my first animated work for a film, a documentary called The Great Hip Hop Hoax, which is great. I’ll be back in Europe for the Pictoplasma festival in Berlin, hopefully be doing something with my band Anxieteam at Pick Me Up 2013 at Sommerset House in London. I will be embarking on an art and performance tour of the Far East shortly after that.